Today was an exciting day. 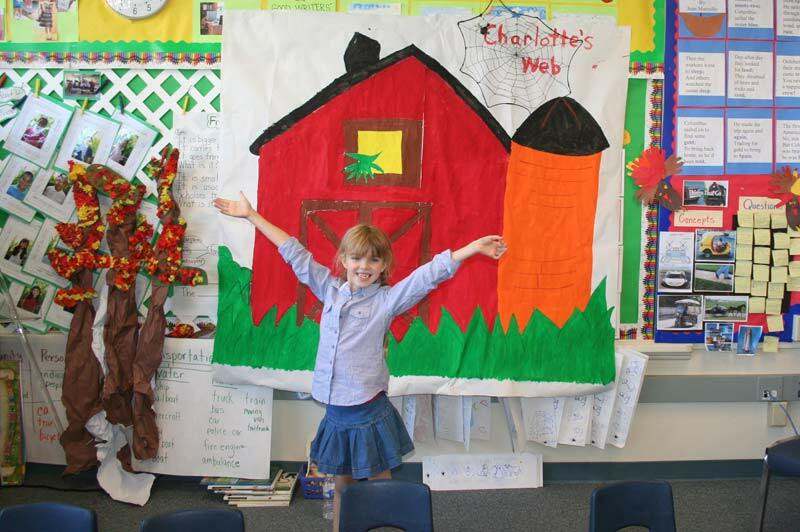 Amara’s 1st grade class did a Readers Theater performance of Charlotte’s Web and Amara played the role of Charlotte. She was a star and I was so excited that I got to be there to watch. She has the most wonderful 1st grade teacher, I’ve told you about her before when I told you about building a scarecrow. 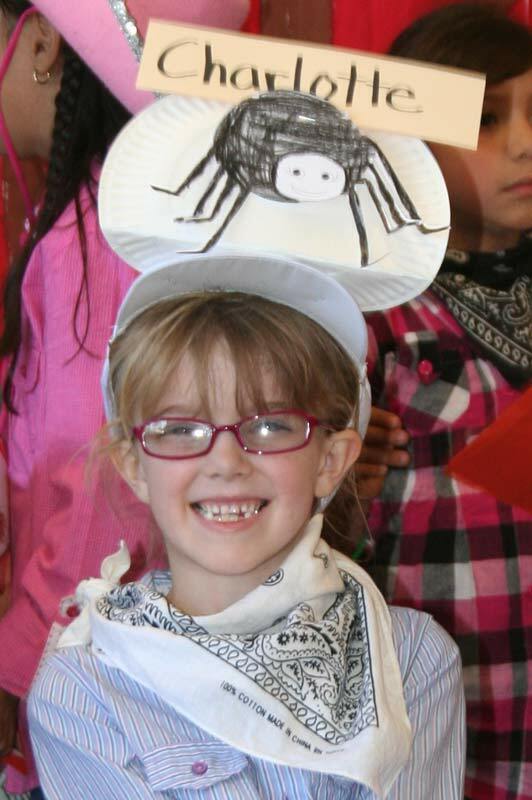 She and the class have been reading Charlotte’s Web. Today she had all of the students dress as farmers. 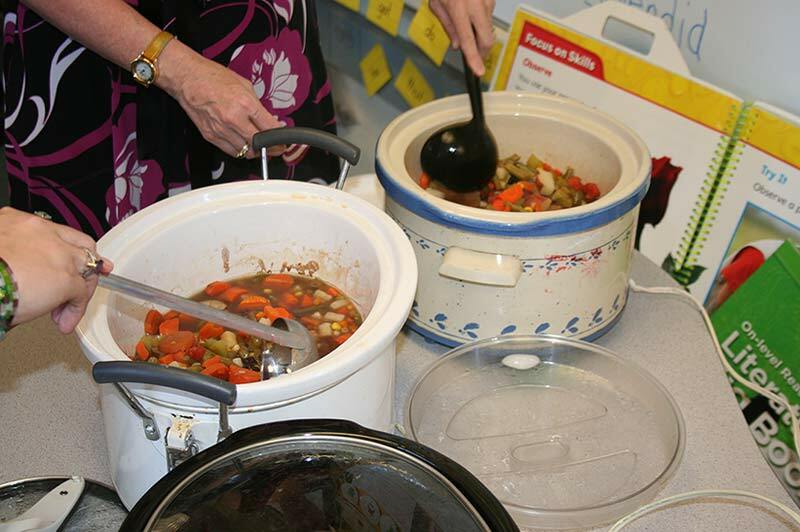 Together with the help of some volunteer parents and grandparents the students made homemade butter and chopped vegetables to make soup — which they served after the play. Now in case you’re not familiar with the idea of a Readers Theater, it is when the actors don’t memorize their parts but read them with emotion. They were all so cute! You could tell they had worked hard to be ready. Amara had been so excited and had been making all of us “run lines” with her! We had a scare last week when she got pneumonia and of course I worried she wouldn’t be well for the play but she bounced right back and she really was great and she looked so studious in her glasses and her pigtails, just like her Mommy looked in 1st grade. 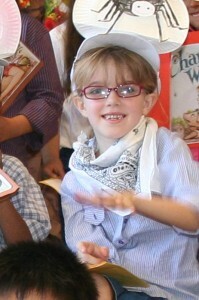 Each of the cast members had a speaking role and wore cute hats. Amara’s had a paper plate with a cute black spider on it and her name, Charlotte. Her teacher had also recruited some parents to help the kids paint the backdrop for their play. When the play was over all the kids took turns getting their pictures taken by parents and grandparents. I should tell you that the turn out was huge! Jenna said they expected 70 and I believe there were that many of us, all perched on little blue plastic chair built for 1st graders. Jenna and I opted for the floor. Amara and I love to go to the park and swing together. We sit in the same swing but she sits facing me so we look like a spider. Years ago I taught her to sing the old Who song “Boris the Spider” while we do this — now we will be singing “Charlotte the Spider” but to the same tune. She is so much fun. Today when I went to go home Amara started to go through her good bye ritual only it changed a little bit. She sent home Charlotte bites. I have to explain. When I leave her house she has to send hugs and stuff home to Grandpa. “This hug is for you.” “This hug is for Grandpa.” “This kiss is for you.” This kiss is for Grandpa.” She would then send him pokes, give me pokes, send him tickles, give me tickles send him spider bites and give me spider bites. And sometimes pets for each cat. This just gets a bit long sometimes when your trying to get out the door so it becomes hugskisspoketicklespiderbite as she at least names each of the events. Tonight she got to spider bites and she says “and give Grandpa Charlotte bites” and she burst out laughing. It was just a wonderful afternoon. This post has been linked to the GRAND Social blogging event at Grandmas Briefs. This memory was posted in Volunteering and tagged 1st grade, Amara, backdrop, Boris the Spider, Charlotte's Web, farmers, glasses, Grandma, Grandpa, homemade butter, Mommy, paint, park, pigtails, pneumonia, pokes, readers theater, reading, run lines, school, soup, spider bites, swings, The Who, tickle on November 4, 2010 by Grandma Kc. Wish I could have been there!!! Also, should get credit for being the first one to sing “Charlotte the spider”. That is just the sweetest story. I will be attending a play for Tucker and his classmates just before Thanksgiving. Will blog about it. Thanks! And I feel like I left out so many little details. I can’t wait to hear about Tucker’s performance. Aren’t you glad we can capture it all so easily? So glad you’re getting to be there for all these special times! Thanks for taking the time to share them with us!!! What would we do without digital cameras and the internet??? Dear baby sister — what would we do without the internet? Housework!!!!!!!!!!!!!! Sounds like a great afternoon! And I love your goodbye ritual. I was a youngster when Charlotte’s Web was first released. A local newspaper ran it as a serial, and I could hardly wait for each day’s segment! How very cute. I’ll bet you were a proud grandma. I think my face hurt from grinning so much! So much fun. Love to see children who love to learn. Hey, Grandma, how’d you get off work? This is so sweet! It brought me back to the days when my daughters read that book and participated in Reader’s Theaters. And then there were the years we had great, creative teachers too, and that made everything even more special. How much fun to watch kids thrive in such supportive atmospheres! And I LOVE the “good bye” ritual! LOL how cute can you get? Oh how fun!!! Very cute! I adore any kind of theater. Reader’s theater is awesome for kids. Charlotte’s Web is one of my all time favorites. Charlotte bites is precious. As is Amara. I love the idea of reader’s theater. Sounds like a caring and creative teacher, one who will surely live in Amara’s heart for years to come. Thank you for sharing this in the GRAND Social!